No this is not some kind of Spanish Airline....It's a brilliant piece of technology utilized in kitchens across the country for what is now known as pacotizing. The Paco Jet is a pureeing tool that specializes in grinding down frozen materials. 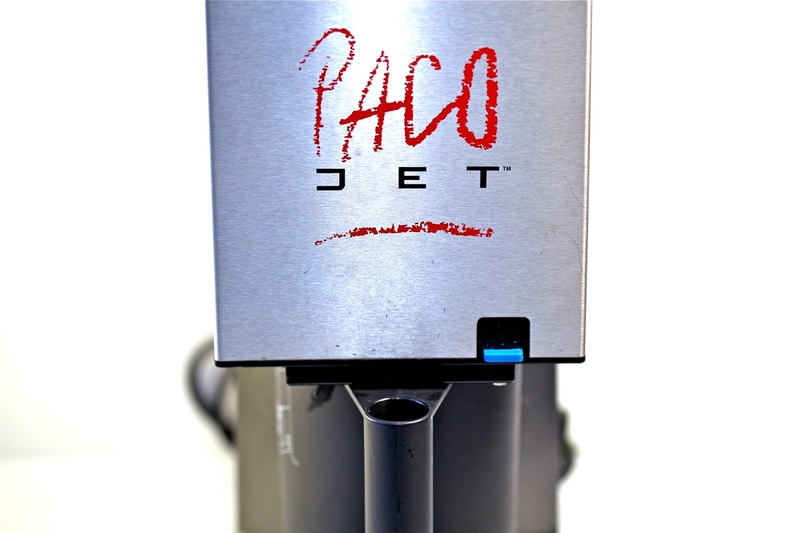 The Paco Jet needs a fair bit a preparation time before it can be utilized for optimal results. First thing you need to do is fill the ingredients into the stainless steel beaker and immerse them in liquid and freeze the beaker to between -4 and -8 degrees fahrenheit. Once the ingredients in the beaker are down to proper temperature you can insert the beaker into the black guard and slide it into the machine and lock it into place. Once the machine is turned on the systems high-speed blade begins spinning at around 2,000 rpm as it begins pacotizing the frozen ingredients. As the machine grinds away at the frozen mass it is blowing 25 psi jets of pressurized air at the food. The jets of air supplement the shearing forces of the blade and act as a double-grinding process. This double-grinding process enables the Paco Jet to grind frozen material down to two microns across in size. The Paco Jet can make frozen powders, gelato, ice cream and sorbets. If the freezing point of the ingredients being pacotized are not depressed by the addition of soluble solids or liquids than a dry-frozen powder will result. The powders can be simply utilized for plating or can be added as a seasoning when cooking. If the freezing point of the ingredients being pacotized are depressed using soluble solids or liquids than a smooth sorbet, ice cream, or gelato will form. The ice cream, sorbet, and gelato are more dense and smooth than their traditional forms. This is because the Paco Jet does not add air into the fat of the product so it's final volume is much less than a traditional churned product. The incredible smoothness of the final product is a result of the dual-grinding process that takes large ice crystals and makes them into microscopic ice crystals, which have a smoother mouth feel when consumed. 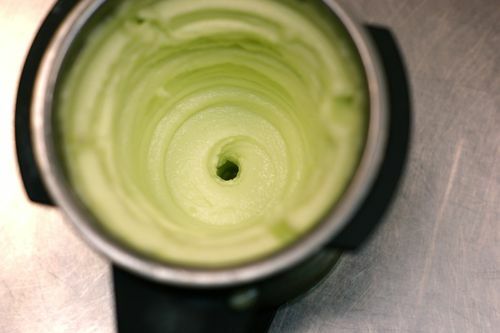 A traditional churned frozen treat takes a liquid mixture and freezes it gradually which creates larger ice crystals, thus a more grainy texture results. Paco Jet Safety: Since the machine creates high levels of pressure up too as much as 17 psi inside the grinding chamber you should never introduce any liquid nitrogen or carbonated substance into the chamber. The expanding gases will raise the pressure in the container and can cause a dangerous explosive reaction. 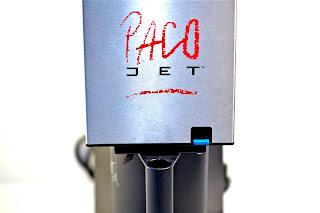 During grinding if the psi in the container is getting too high for your preparation Paco Jet has a pressure release button, that allows the user to release small amounts of air pressure from the container.